We ventured north for today’s tour, beginning with a long drive as we set out to explore the area of the southern Golan Heights. The weather forecast was not promising, with heavy storms (including thunder and lightning!) predicted, but the hardy folk of the tour guide course cannot be put off by such things, so we donned our waterproofs and thermals and mentally prepared ourselves for adverse conditions. 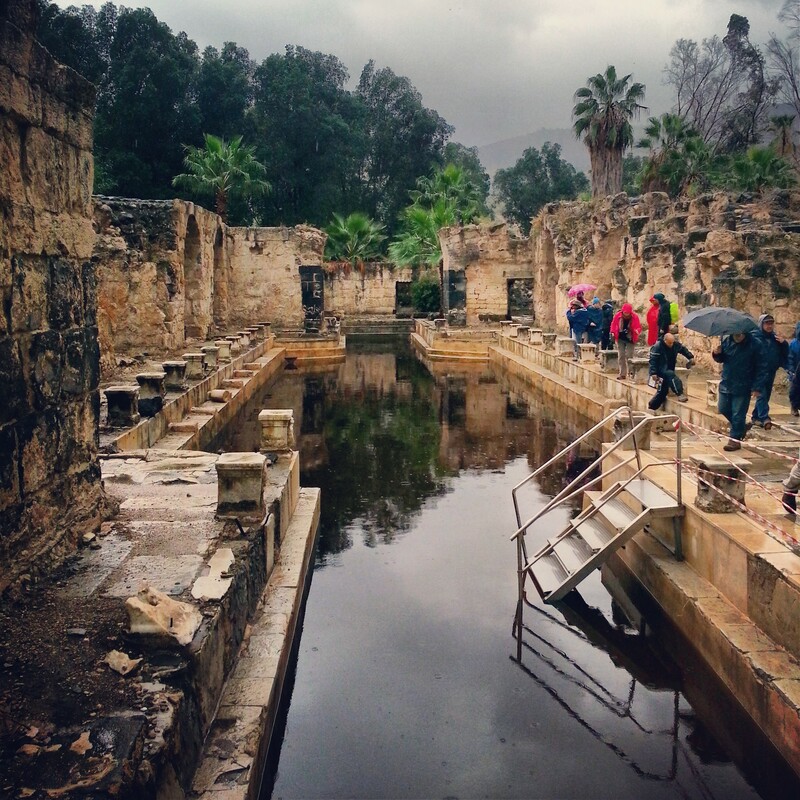 Our first stop of the day was at the hot springs at Hamat Gader. I had been here a couple of times previously, but had only bathed in the hot springs and visited the alligator park. Little did I know that there were antiquities to be found; indeed it seems that one of the reasons for this is that the owners of the site are in a dispute with the Antiquities Authority about responsibility for the ancient remains. As such they are currently closed off to visitors. Still, a gate is not enough to put off intrepid future tour guides. Having been first told that we should not bring tourists here while it is closed (our insurance will not cover it!) 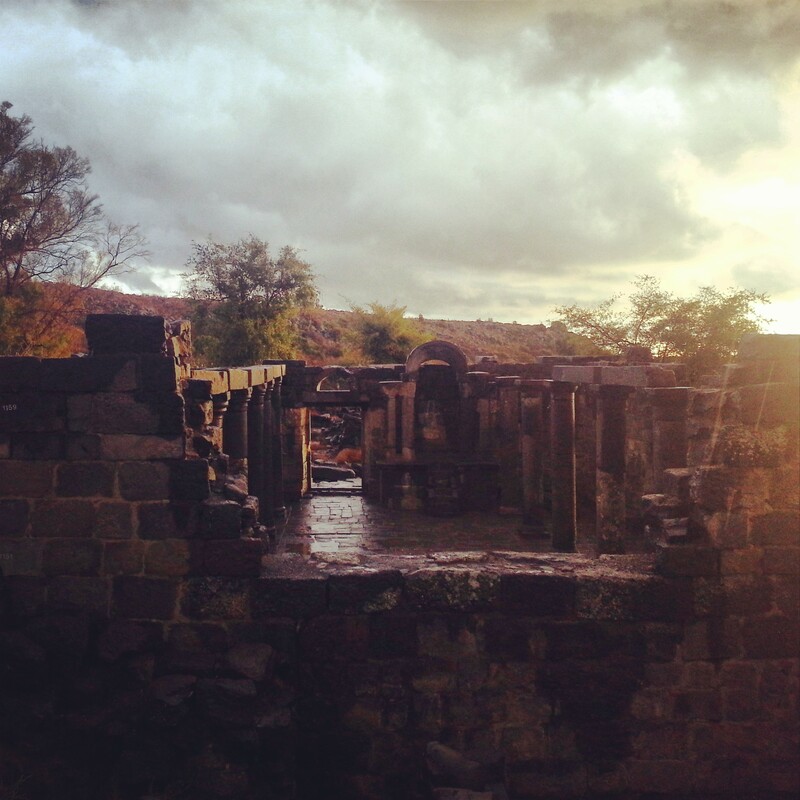 we popped over the gate, to explore the very impressive ruins. We learned that this was the site of the 2nd largest bathhouse in the Roman Empire, and the structures that remain are quite remarkable. We discussed life in the bathhouse and the ancient tourism trade to the area, which stopped after the site was destroyed in a large earthquake in the 8th century. It took the British in the 20th century to see the potential of the area for tourism, and since then (with a bit of a break after the Israeli Independence War – it ended up in the demilitarised zone between Israel and Syria, and right on the Jordanian border) the trade is roaring once more. Sadly there was no time for us to indulge in the hot springs! 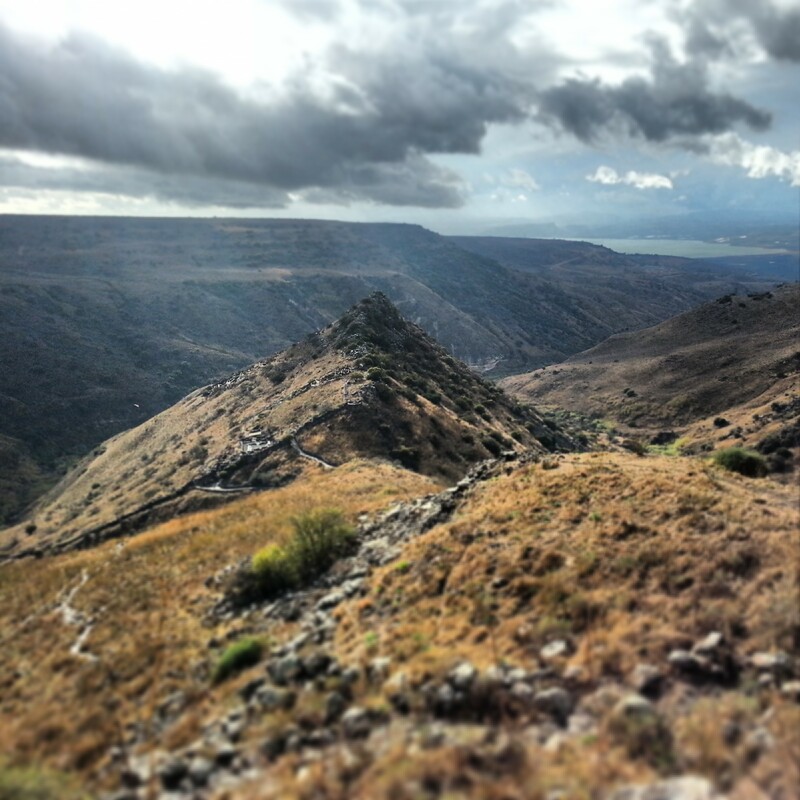 From Hamat Gader, we ascended into the Golan Heights. Avid readers will recall that we explored the northern and central parts of the Golan during our campus in the summer, but there was still plenty to see. We began with a stunning viewpoint over the Sea of Galilee, called Mitzpe HaShalom (Peace Vista). We discussed the creation of the borders of Israel, and enjoyed the dramatic view with the storm clouds sweeping towards us (although fortunately, not yet reaching us). We then travelled further north to the 2nd temple period settlement of Gamla. So named because of its similarity to a camel hump (gamal is the Hebrew for camel), it was the site of a major battle in the Jewish revolt against Roman rule. Gamla was lost to history until it was discovered in the late 60s, after Israel had taken the Golan Heights in the Six Day War. The story of Gamla is a brave last stand followed by a tragic massacre, not dissimilar to many other sites where Jews tried to rebel against the great Roman army. We didn’t make it down to the archaeological site which contains one of the oldest synagogues in the world, but had a good viewpoint over it as our guide read to us from the story of the battle from Josephus. The site also has a large population of large birds of prey, including the huge Griffon Vulture. We went to a look out over their nesting area and saw them soaring above us. Not too close, fortunately! Our final stop of the day was at Umm el Kanatir, also now known as Rechavam’s Arches after Rechavam Zeevi, whose last act as Tourism Minister was to approve this project. Excavators discovered the remains of a Jewish settlement here from the Byzantine period, including a grand synagogue. Unusually, because of the site’s relatively remote location, all the stones of the original structure are still in situ. Using a computer programme and complex ultrasound techniques, the stones were all mapped into a virtual jigsaw and are now being painstakingly reconstructed. They hope to open the site in a couple of years and it already looks impressive. It is remarkable to see an original ark from 1500 years ago! With the sun setting over the distant Sea of Galilee, and the serious rain clouds vast approaching, it was time to begin the long journey back to Tel Aviv. Next week we follow in the footsteps of those trying to break the siege of Jerusalem in 1948. Stay tuned!